When I began Storied Threads, I was building on the love of costume design that I had developed working with Pastimes Entertainment. I loved creating unique costumes and garments, and so began my company intending to sell unique garb at renaissance faires. To me, it seemed like a natural progression. My tent at my second show, Silver Kingdom 2007. As with any new business, things started off small. VERY small. My first every faire was Festival of the Lion in 2007, where I set up my minimal stock in an EZ-Up style tent and quickly learned that there’s more to selling garb than just being there. If I recall correctly, I left that show having sold a single pirate sash, and a single sideless surcoat. Not to be deterred however, I learned what worked and what didn’t, gradually increased my stock, refined over the years how my items were displayed, figured out what sold and what didn’t. And then, in 2011, I bought my first embroidery machine, and everything changed. I mean, not all at once, don’t get me wrong. But I began making patches, and then I began making messenger bags and scarves. I found ways to tap into pop culture and geek culture, and to create my own original designs. And slowly but surely, that part of my business became MOST of my business — and allowed me to leave my day job to do this full time. 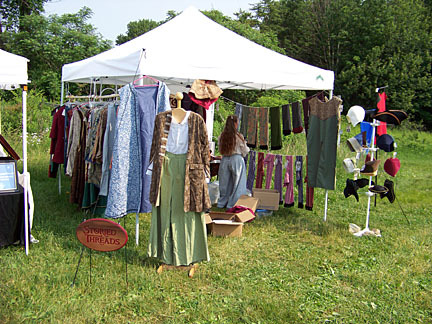 The Storied Threads tent last fall, sporting a much different look than our early set-up! 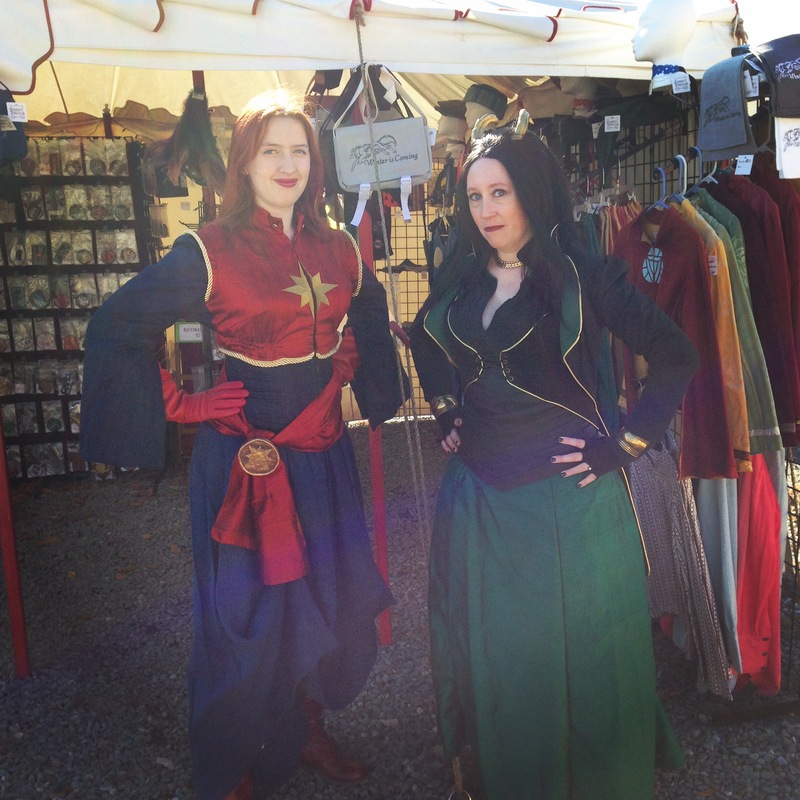 I started vending fewer ren faires, and more and more pop culture conventions. And it reached a point where I was only making garb for two events a year — but the garb for those two events ate up nearly a third of my time in the studio. The more I thought about it, the less practical this seemed, and I realized that the next step for Storied Threads was to streamline our production, and focus on only one direction. And it seemed clear to me that I was going to have to stop vending at ren faires in order to make that happen. This past Sunday, we went down to North Haven to set up our tent for the Connecticut Renaissance Faire, which I predicted would be my penultimate faire. When we got there, I made a point of speaking to the owners first thing, to let them know what I had been thinking. I’ve been working with them for a long time now, both as a vendor and as a sometimes costume designer for their shows, and I felt they deserved to hear this news before anybody else. And then they totally surprised me. 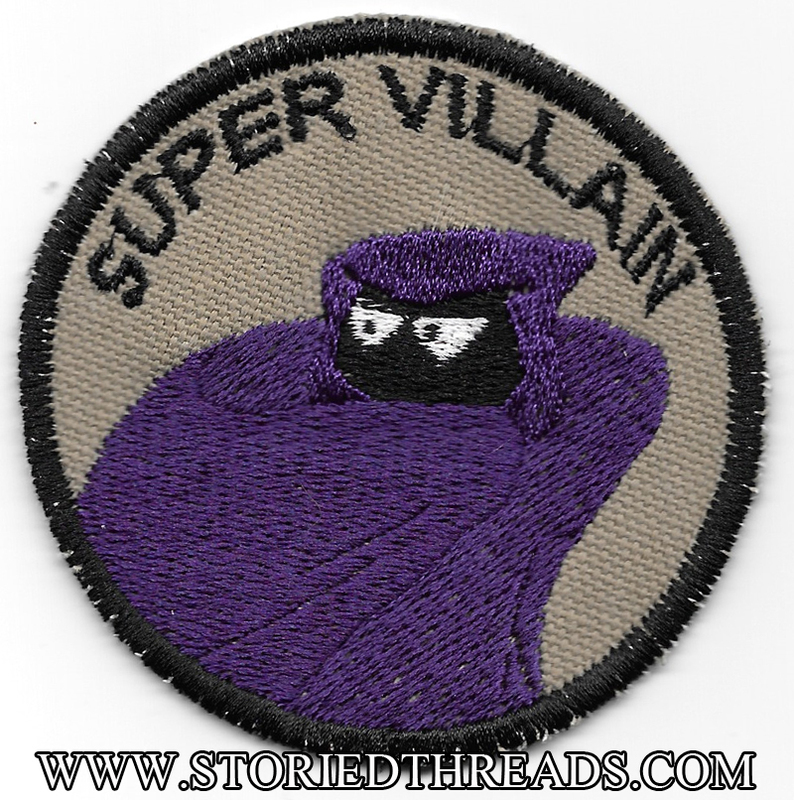 After talking amongst themselves, and discussing they pros and cons, they made me an offer — if I stayed as a vendor at the Connecticut Faires, they would let me set up a tent that was based solely in the kinds of embroidered geekery that I sell at cons. I’ll be selling patches, bags, scarves, even ties and bowties, and phasing out the garb I offer entirely. What this means for my customers is that the garb that I currently have cut and prepped is the LAST clothing I will make for sale at faires. Additionally, a lot of what I have in stock will be discounted, some of it quite dramatically, so that I can clear it out to make room for our new business model. Whether this will be a successful endeavor or not remains to be seen. I don’t yet know if I can make the kind of sales that I need to at a faire, selling only this kind of merchandise. But I hope that I can. 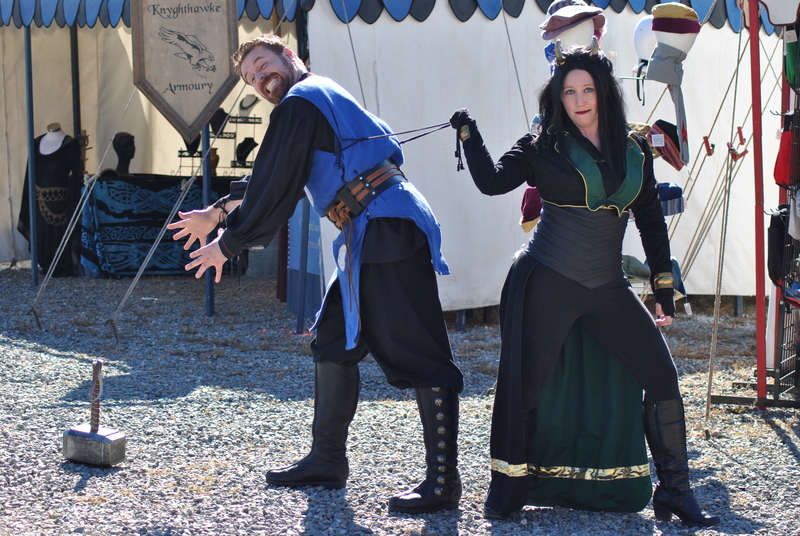 And I’m extremely grateful to the Connecticut Renaissance Faire management for being so willing to work with me, and to help me try to make it successful for both of us. That sort of thing is why this Faire is family to me. A man can only take so many insults to himself and to his family, you know? There comes a time when it cannot be overlooked anymore, and you just need to seal up the offender behind a wall of brick. 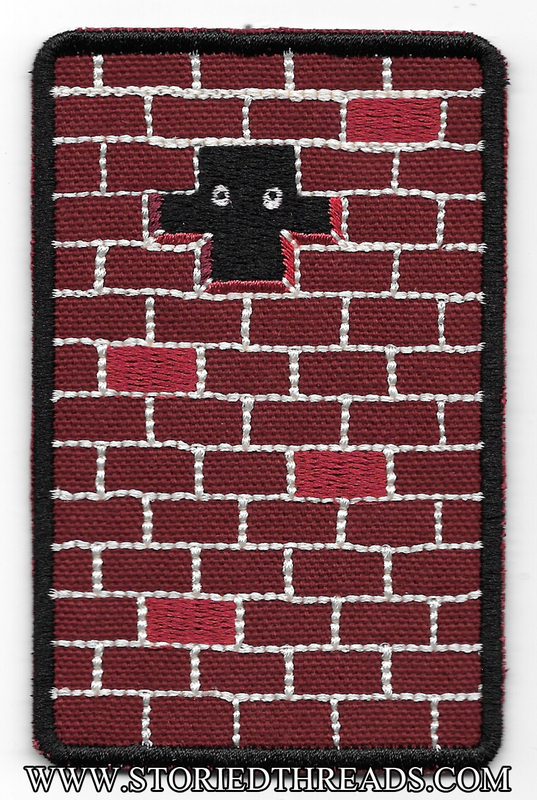 This new design, inspired by Edgar Allen Poe’s short story “The Cask of Amontillado”, is available as a patch in both our Etsy store and on our website. It is also available as a sticker, an iPhone case, and a variety of other items in our Redbubble shop. 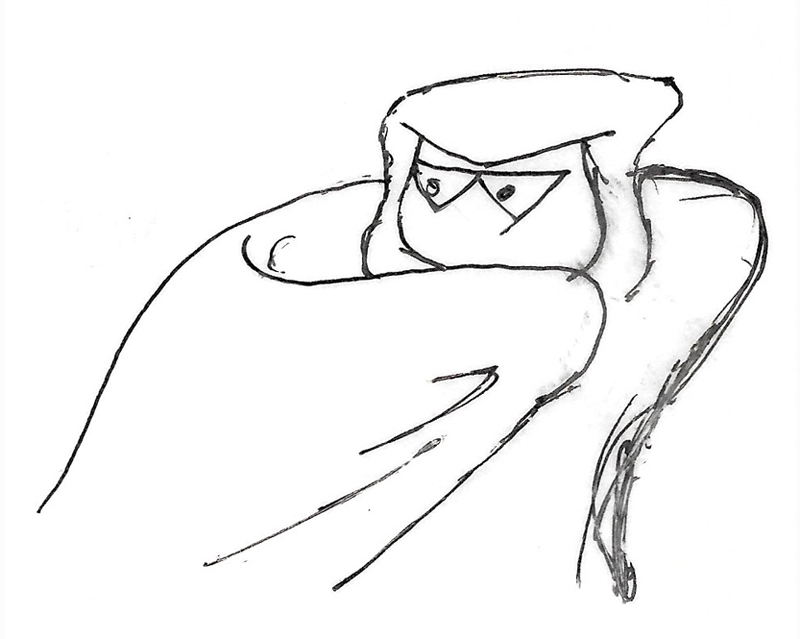 You know that feeling, when there’s something you desperately need to keep secret? And the more you talk to the person in front of you, the more convinced you are that they absolutely know you’re lying, and can see the guilt written all over your face? Yeah. Edgar Allen Poe knew that feeling, too. In addition to being available on Etsy and on our website as a bookmark, this new design is also available on Redbubble as a sticker. Click here to buy the bookmark! Or, as we’ve come to call it, the IlluminaTIE. Ba-dum-tsh. Sometimes, society demands that you wear a tie. So why not wear one that proudly displays the things you love? 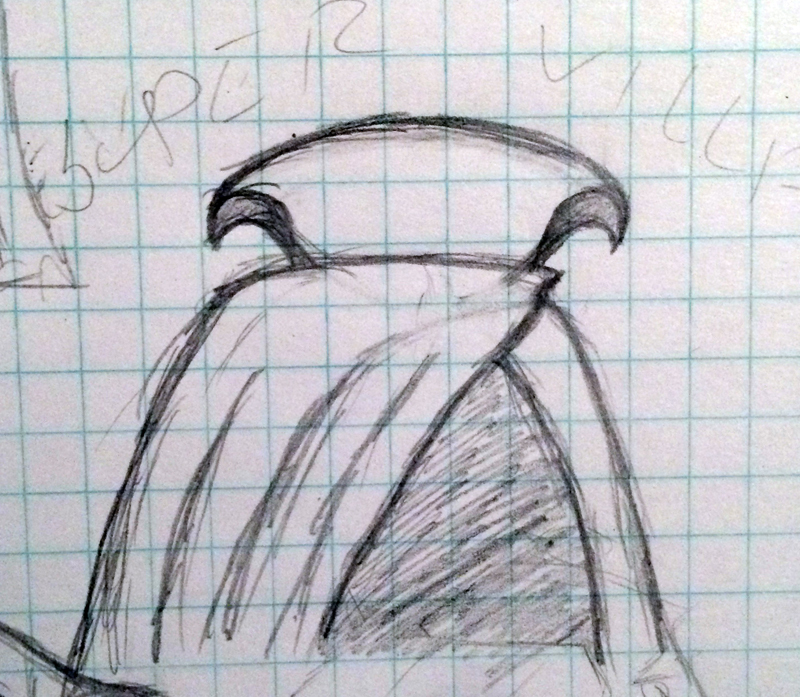 And secret world-controlling cabals certainly know the value of being well accessorized. So what theme could be better to sport on your own accessories? 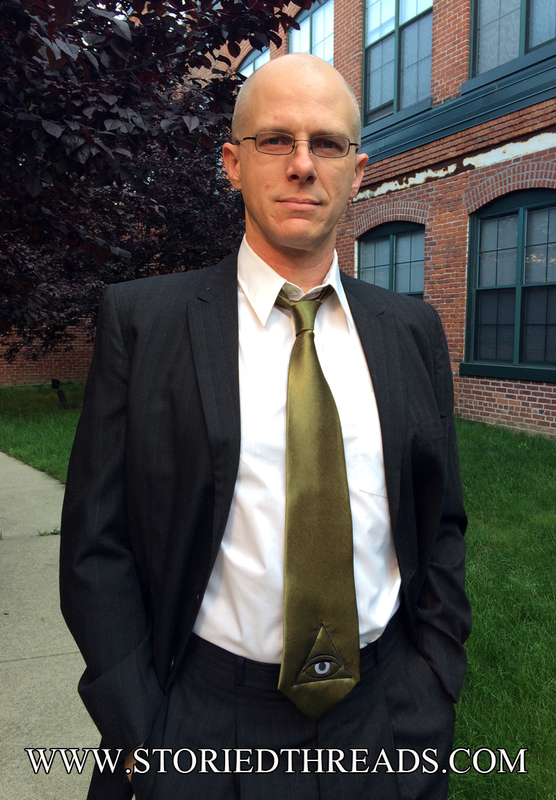 This tie is 100% money-green silk, embroidered with the symbol of the Illuminati in black and gray. It is available in our Etsy shop, and on our website. Here at Storied Threads, we’re big believers in wearing your geekery on your sleeve. Or on your bag. Or your hat. Or, really, wherever you like to stitch or glue your patches. With that in mind, we offer a line of Fandom Pride patches! Whether you simply have great admiration for warrior women, or you are an Amazon yourself, this is the patch for you! 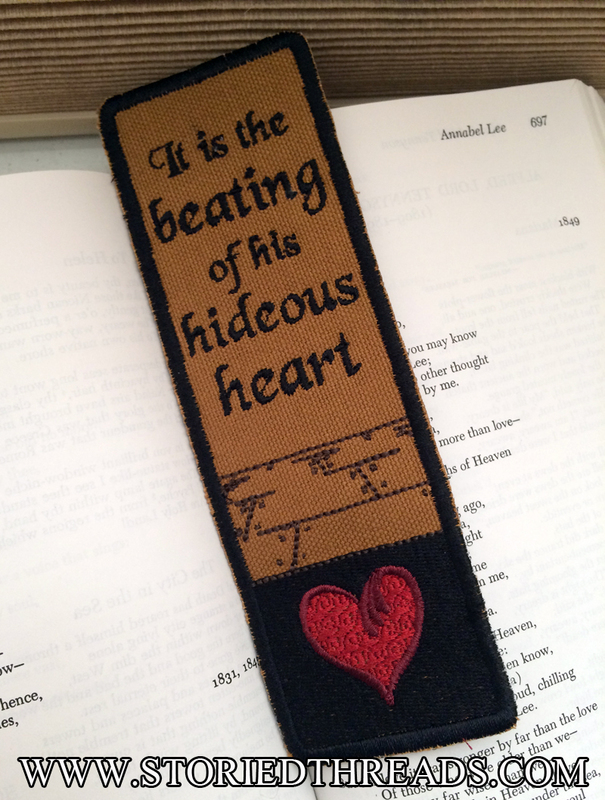 This sew-on patch is stitched in blue and gold on red cotton canvas in a Greco-Roman inspired font. It is available as a patch in our Etsy shop and on our website, and is available as a sticker on Redbubble. So naturally, I passed the reins over to him. He settled in the next day and improved on my rough concept so completely that I was blown away. He started with a rough of his own, which you can see here with all the penciling and little lines and circles that formed the base still in place. He explained to me the color scheme he had in mind, and we talked about embroidery-level details — which pieces would be separate, to allow for running the stitching in different directions to provide detail without changing colors. Where to allow that detail to come through in carving stitches. That sort of thing. 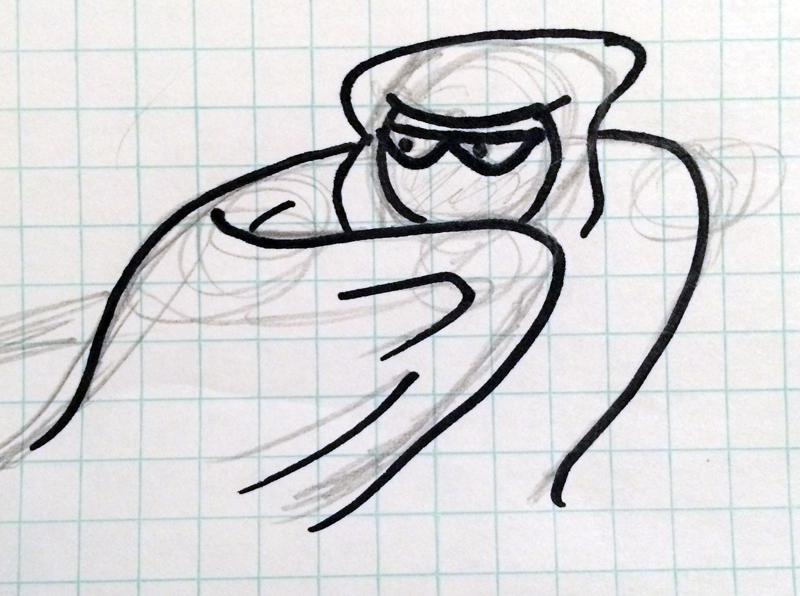 And then he went off to finalize the artwork before giving it to me to digitize. I did my digital magic with the design, and finally the whole thing was done! We were both really happy with the design, including the subtle way the stitching tricks created detail and depth to the Villain’s cloak. So we scanned it in, got it listed on Etsy and in our webstore, and we hope you all like it as much as we do! Superhero geek merit badges, available on Etsy and on our website. The superhero is an iconic archetype in pop culture. The classic superhero represents the potential within all of us to stand up for what’s right, protect the weak, and help those in need. This entry in our Geek Merit Badge line celebrates all those who rise to the occasion and leap into action to save the day — even if they don’t wear a colorful costume and flowing cape while doing it. This Geek Merit Badge is available depicting a male or female superhero, in your choice of Caucasian or POC. Want to customize the color scheme further? Shoot us an e-mail, and we’ll be happy to help you out. It is available as a patch both in our Etsy shop and on our website, and available as stickers on Redbubble. Superhero Scarf, available in our Redbubble shop. On Redbubble, we’ve done something a little different with this design. In addition to being able to purchase individual stickers, you can purchase a set of four mini-stickers, or purchase the group of four on a few other items, such as duvet covers, scarves, and spiral notebooks.